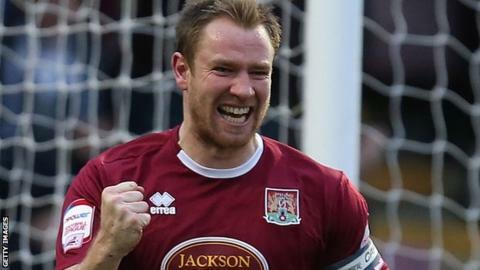 Northampton Town captain Kelvin Langmead hopes his winning goal against Southend makes up for playing a part in the Blues' equaliser. He inadvertently flicked Matty Lund's header into his own net but scored in injury time to give his side the win. Langmead, 27, told BBC Radio Northampton: "He had a free header and I tried to get something on it. "Thankfully, I've got the goal at the other end. Hopefully it cancels that out and everyone will forgive me." His seventh goal of the season helped the promotion chasers record their seventh win in their last 10 matches. Victory at Roots Hall was just their fourth win on the road this season and the skipper believes they will need to record the same number again to stand a chance of gaining automatic promotion. "To be realistically challenging for third place, we probably need to win another three or four away games," he added. "It's very close. Teams will beat each other and take points from each other." Cobblers manager Aidy Boothroyd has re-iterated his admiration of the Coventry-born player, who he named as captain at the start of the season. "Kelvin is as brave as a lion," said Boothroyd. "There's boots, heads and elbows flying around and he puts his face in the way. He scored and broke his nose against Torquay. He's been absolutely outstanding since I've been here. I'm really pleased and lucky to have him." The former Peterborough defender was previously utilised as a striker by Shrewsbury, for whom he scored 18 goals between 2004 and 2010. He is now just two short of his best-ever goal-scoring season in 2005/06, when he notched nine goals for the Shrews.